Capturing the elegance of a bygone era, the Devonshire Suite is reminiscent of old-world design. The rounded basin of the lavatory introduces a gentle feel to its square deck and the toilet echoes this unique profile. The suite's simple, striking combination of curves and lines adds refinement and distinctive visual impact to bath and powder rooms. Devonshire accessories offer decorative styling and versatility for any bath or powder room. Premium material construction ensures years of reliability and durability, and this 24" double towel bar is roomy enough for several of your thickest bath towels. This accessory ships with necessary installation tools to save time and money. 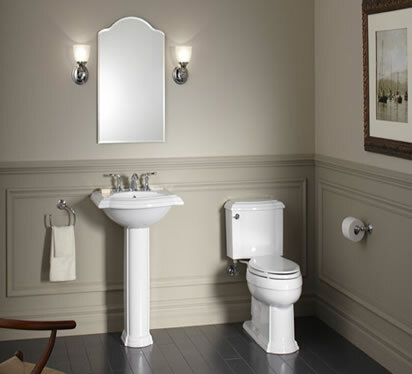 This Devonshire 24" pedestal lavatory offers decorative styling and versatility for any bathroom. Echoing the curves and lines typical of old-world design, it complements other products in the Devonshire Suite to bring refinement to bath or powder rooms. Capturing the elegance of a bygone era, this Devonshire BubbleMassage bath is reminiscent of old-world design. High-quality acrylic construction ensures durability and luster, and a palette of KOHLER colors is available to complement any decor. The variable-speed blower/motor with integral heater delivers a range of water treatments from light bubbling to revitalizing massage, while 120 innovative airjets are precisely positioned to completely embrace you with bubbling water.